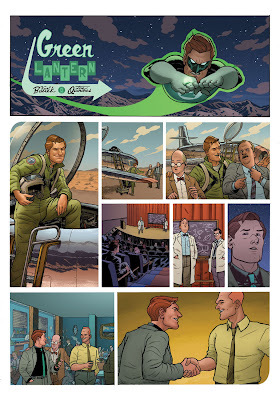 Joe Quinones' interweb-log: So many Wednesdays... Wednesday Comics #4! So many Wednesdays... Wednesday Comics #4! Another week, another Wednesday, and with it comes the release of issue 4 of Wednesday Comics. We're now a third through the series and all the stories seem to ramping up this week. Worth checking out, says I. Continuing to enjoy your GL work on Wednesday Comics, Joe. I really like the distinctive, Disney-esque look to the characters. Your page in Wednesday Comics is what keeps me buying it every week. I don't even know if I've read them, but I've ogled every panel! Its fantastic. I had a couple (bonehead) questions about your coloring, if you don't mind me asking. I was wondering what program(s) you use to finish up your work. More specifically, how are you altering your inks? How are you changing your clean, black line work to such wonderful, subtle colors? Layers? Masking, perhaps? Magic? However you're doing it, please don't stop. Thanks! I've been wanting to do a Paul Newman Green Lantern Sketch. I really appreciate that. Awesome!